The Rifter is an idea factory that helps players and Game Masters to generate new ideas and keep their games fresh. It provides useful, ready to go source material gamers can just drop into their ongoing games. A doorway to new possibilities and numerous Palladium roleplaying worlds. It offers new characters, OCCs, powers, magic, weapons, adventure and ideas for your games. It presents new villains, monsters and dangers to battle, and new ideas to consider. 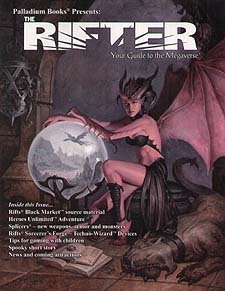 Every issue has material for Rifts and at least two or three other Palladium game lines. Rifts Black Market - Trust and Intimidate: A Way of Life: suitable for ALL settings, but ideal for operatives, thugs and dealers in the Black Market. Rifts Sorcerer's Forge - A hidden community of Techno-Wizards with more than one secret to conceal. Many new and unique TW weapons, power armour and gear, as well as details about the place and some of the interesting inhabitants. Splicers - House Pandorum is one of the Splicer clans making moves. Get details about the house itself and a host of new Splicers, weapons, armour, mutants and monsters. Heroes Unlimited -Superhero adventure that starts in space and brings a cadre of erstwhile alien heroes and their spaceship to Earth. Modern Horror, Short Story - A tale of intrigue and mystery. Gaming with Children - Step by step suggestions on how to introduce role-playing games to children by a Game Master with personal experience. 96 pages of fun and adventure.